I now want to look at the most important aspect of Creation; Who is the Creator? How does the Hebrew language of Genesis describe Him? You have probably heard from some theologian or the other that the Hebrew word for God is Elohim, and that this word is a plural noun. Yet the verb that goes with it is in the singular. This is already a hint of the Trinity; plurality in singularity. The first three words of the Bible; bereshith bara Elohim, refer to history (there was a beginning, bereshith), then to creation (bara, he created), and then to the Creator, Elohim. God, therefore, is a Creator, and operates in real history, not in some abstract realm of man’s imagination. Christianity is above all an historical faith. But when we arrive at the second chapter of Genesis, we soon meet another name, for which the Hebrew letters are YHWH. This set of four letters has become known as the tetragrammaton. The Jews of the late BC period would not pronounce this word, so they substituted a word adonai meaning ‘Master’ (or ‘Lord’, as we say in a religious way). To help Jewish readers, they put the vowels of adonai against the four consonants YHWH, so that a reader would find something like YaHoWaiH, which in European languages became Jehovah, with ‘j’ pronounced at first like a ‘y’, and ‘v’ like a w.
This name is somehow connected in origin, so linguists believe, with the name by which God revealed Himself to Abraham in Genesis 15:7, and even more clearly to Moses in Exodus 3:14. This name is Ehyeh or I am, implying I exist, I am alive. Furthermore, the prefix Yehu (often spelt ‘Jeho-’ in our English Bibles) attached to the name of famous people in Scripture derives from this name, and the Hebrew form of Jesus is Yehoshua, meaning, YHWH saves. So the Genesis form YHWH has special connection with Jesus. Finally, we notice that in Genesis 1:2b the term Ruach Elohim occurs, indicating the Spirit of God. Thus there is evidence in more than one direction of the Trinity in Genesis. The work of Creation was so important that it involved God in His three persons: Elohim, YHWH and Ruach Elohim. The name YHWH was a more intimate name than Elohim. Elohim can refer to other gods, and even to heroic figures and angels. It is the general term for God. But YHWH was the God of Abraham and his descendants, and is a personal name. For the Jews it became so sacred that they ceased to say it. In the New Testament, Jesus allows himself to be called ‘Lord’, which is our translation of Adonai, the substitute word for YHWH. Jesus is, of course, a personal name, a human name, so God has a name which represents his life in human form. All through the Bible we find references to the Spirit of God, who came ‘upon’ people in the Old Testament, and after Pentecost comes to dwell ‘in’ God’s people. All three Persons of the Godhead appear to have been involved in Creation, especially the creation of man as recapitulated in Genesis 2. Notice also the language of the work of Creation. In Genesis 1:26 we find the expression ‘Let us make man in our image, according to our likeness… These plurals are particularly associated with the creation of man (1:27), 50 that it seems that the Bible stresses the persons of the Godhead at this point. Is God to be Thought of as Masculine? My answer is yes. The Bible teaches definite roles for men and women and doesn’t make the sexes equal in all respects, though it makes them of equal value in God’s sight. The male is the responsible, or answerable partner in a marriage, and the female is the supporter, or helper. In Genesis 2:18 God decided to provide an ezer or helper for the male he’d created. This is the same word as we find in Ebenezer, ‘thus far he has helped’, in 1 Samuel 7:12, though Ebenezer itself only means ‘Rock of Help’. But before you go off and say God is here called a female helper, I must inform you that ezer is masculine. What God said in Genesis 2:18 was really: ‘I’ll provide some help for him.’ This is, strangely enough, an unusual example of an abstract noun being masculine in Hebrew — most of them are feminine. As for God Himself, His name alone, Elohim is plural. Since words ending in -im are just occasionally feminine but almost always masculine, this isn’t an absolute proof that Hebrew puts a masculine slant on God. For this we need the verb-form, and this is clearly and unambiguously masculine. Whenever this plural noun ‘God’ is the subject of a sentence, the verb is in the masculine singular, thus indicating not only masculinity but a one-many relationship in the Person of God. This is a rather startling grammatical feature of this word Elohim, and that’s how we know whether to translate it God or ‘gods’. The latter is only possible when the verb is plural, as in Isaiah 37:12, ‘Have the gods of the nations delivered them. . .?’ Here, Elohim is preceded by the plural verb-form Ha-Hittsilu, ‘have they delivered’, so Elohim must mean ‘gods’. The same grammatical feature, masculinity, applies to the sacred name YHWH, usually translated ‘the Lord’. This always takes a masculine verb. However, there is no plurality this time. It’s probably in God’s intention that it should reflect something of the Lord Jesus Christ. After all, Jesus expounded to two, on the Emmaus road, things about Himself from ‘all the Scriptures’ and that included Genesis through to Malachi (Luke 24:27). When God is referred to by a pronoun, it’s always the masculine huu, ‘he’ and never by hii, ‘she’. So there‘s just no way that anyone could read some feminine or even common gender principle into the Hebrew for ‘God’. You can, of course, see a dim picture of a trinity, but here again, all are masculine. The verb is the determining factor. Though ruach, ‘spirit’, is normally a feminine noun, when it refers to God it is coupled with Elohim and partakes of its grammatical and semantic properties. Thus in 1 Kings 22:24: Which way did the Spirit of the Lord go…? the word Ruach takes a masculine verb abar, ‘went’. As far as the grammatical implications of the Hebrew language go, there’s no warrant for claiming that the Bible teaches a non-masculine element in the make-up of the Deity. This is merely the projection of present-day wishful thinking on the part of those who would like to see all distinctions made by God to give us variety in this world, ironed out into one big conglomeration of identical individuals. What is much worse, it is strongly motivated by pro-homosexuality ideas, so-called women’s liberation, etc., which, like science, changes over the years. The main difference is that science is good when subservient to God, whereas these ideologies are themselves anti-God and irredeemable. Of course, the people who espouse them are redeemable, and when redeemed generally renounce them, recognising the satanic source from which they come. Thus the family principle, with a responsible male head and a submissive female partner who is important in her special role, pervades the whole of Scripture, from God downwards. 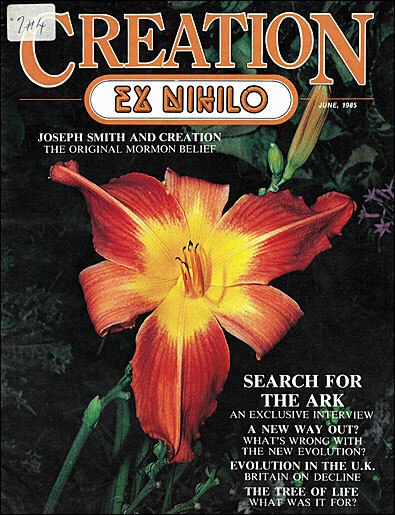 In addition, the language of early Genesis is not only clear on such things as the origin of the material world and the physical origin of man, but it already contains signs of God’s eternal plan for man in the redemption of the world through His Son, the Lord Jesus Christ, whose identity is hidden in the names used for God Himself.